A winner at this year's Microsoft Partner Awards is showing how data can help transform social services. While the lead government social services ministry has launched an investigation into a privacy breach that tarnished central government's data programme, Stand Children's Services is already using advanced analytics to improve outcomes for at-risk kids. Stand, a charity providing home and school social services to children aged five to 12, was one beneficiary of Microsoft's Cloud for Global Good programme, receiving analytics software and implementation from Microsoft partner Stellar Consulting. Not-for-profits such as Stand hold rich but often untapped datasets that are vital for measuring and improving community outcomes, Stellar consulting partner Travis Barker said. Most lack the resources and capability to leverage technology to its full potential. Stellar worked pro bono to help Stand utilise the analytics capabilities of Microsoft's Azure cloud platform. The output is a series of dashboards that provide insights into the effectiveness of Stand's activities and programmes and allow these to be fine-tuned to boost effectiveness further. Improvements in children's behaviour and parental attitudes can be monitored and outliers targeted for further investigation. “Now, it’s very quick for us to spot the outliers and high-risk cases, and we can also tell where we have bottlenecks in our organisation that are impacting our front-line services,” said Stand CIO, Richard Parry. Partner awards were made across 22 categories last week. 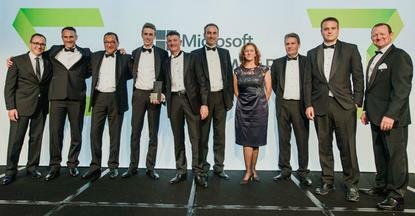 “The winners of this year’s Partner Awards are high-calibre technology companies and have demonstrated proactive and innovative forward-thinking to help Microsoft deliver on its global mission of empowering people and organisations to adapt to digital transformation,” said Microsoft New Zealand’s newly-appointed director for small, midmarket solutions and partner group, Phil Goldie.